The Global Volcanism Program has no activity reports for Bufumbira. The Global Volcanism Program has no Weekly Reports available for Bufumbira. The Global Volcanism Program has no Bulletin Reports available for Bufumbira. The Global Volcanism Program has no synonyms or subfeatures listed for Bufumbira. The Bufumbira volcanic field in SW Uganda consists of a group of about 40 cinder cones lying N of the large stratovolcanoes of the NE portion of the Virunga Mountains. The rocks are noted for their unusual ultrapotassic chemistry. The cinder cones occur in clusters, were erupted along lineaments, and are typically breached on one side by lava flows. Their age is not known precisely, but they are considered younger than the stratovolcanoes of the Virunga Range, some of which are Holocene in age. Ferguson A K, Cundari A, 1975. Petrological aspects and evolution of the leucite bearing lavas from Bufumbira, south west Uganda. Contr Mineral Petr, 50: 25-46. Simmons W C, 1930. Notes on the petrology of the Bufumbira volcanic rocks of Uganda. Geol Mag, 67: 491-499. The Global Volcanism Program is not aware of any Holocene eruptions from Bufumbira. If this volcano has had large eruptions (VEI >= 4) prior to 10,000 years ago, information might be found on the Bufumbira page in the LaMEVE (Large Magnitude Explosive Volcanic Eruptions) database, a part of the Volcano Global Risk Identification and Analysis Project (VOGRIPA). There is no Deformation History data available for Bufumbira. There is no Emissions History data available for Bufumbira. 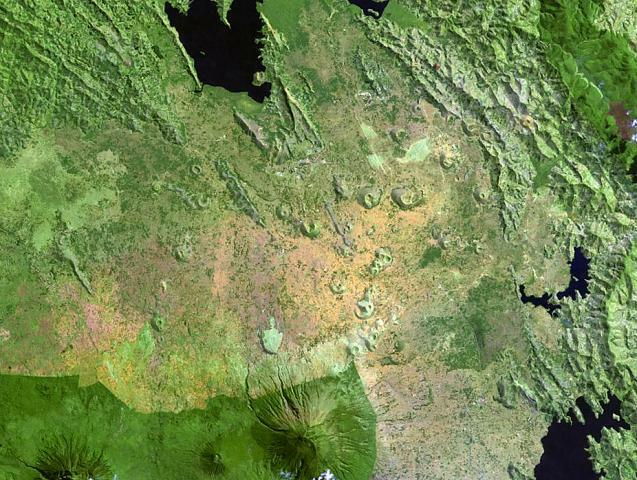 Cinder cones of the Bufumbira volcanic field in SW Uganda (center) lie north of the large stratovolcanoes of the NE part of the Virunga Mountains. The roughly 40 cinder cones occur in clusters and were erupted along lineaments; they are typically breached on one side by lava flows. The Bufumbira rocks are noted for their unusual ultrapotassic chemistry. Muhavura (center) and Sabinyo (left) stratovolcanoes are visible at the bottom of this Landsat image. There are no samples for Bufumbira in the Smithsonian's NMNH Department of Mineral Sciences Rock and Ore collection. Large Eruptions of Bufumbira Information about large Quaternary eruptions (VEI >= 4) is cataloged in the Large Magnitude Explosive Volcanic Eruptions (LaMEVE) database of the Volcano Global Risk Identification and Analysis Project (VOGRIPA).